About this News Video: France and the US agreed that providing anti-Gaddafi rebels with weapons was a possibility Tuesday, as the dissident fighters... emboldened by western airstrikes... were forced to retreat 40 kilometers during an attack by pro-regime forces. 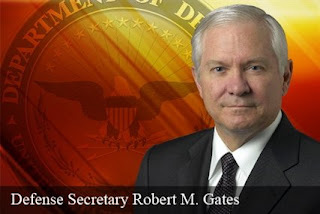 WASHINGTON, March 27, 2011 - U.S. and coalition forces have accomplished the no-fly zone aspect of the United Nations mission in Libya, Defense Secretary Robert M. Gates said during a television interview aired today. 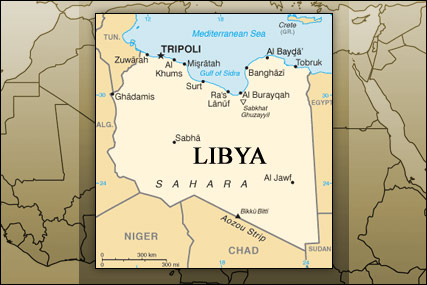 Gates and Secretary of State Hillary Rodham Clinton appeared on NBC's "Meet the Press" and discussed what coalition nations have achieved as actions in Libya enter a second week. U.S. and coalition partners have suppressed Moammar Gadhafi’s air defenses in Libya and have not seen his planes in the air since the no-fly zone was put in place March 19, Gates said. Gates said no decision has been made about supplying arms to Libyan forces opposing Gadhafi, though the U.N. Security Council resolution establishing the no-fly zone permits such action. Clinton said she’s confident the operation in Libya prevented Gadhafi from killing potentially tens of thousands of Libyan civilians and creating a refugee crisis that would have destabilized the region. Now, because of the “good work of the coalition,” Gadhafi’s forces are turning back and the opposition is regaining ground it had lost, she said. Clinton said the African Union has called for a transition to democracy in Libya, and the Arab League will join “others of us who are supporting this effort” for talks in London Tuesday to focus on how to manage such a transition. The United Nations will also send a special envoy to Benghazi and Tripoli in the next several days to send a “very clear message” to Gadhafi, she said. Clinton cited Egypt as an example of political transformation now under way. She and Gates have both visited Egypt in recent weeks, and offered assistance in reform efforts, she said. LOTS of up-to-date info/videos/photos and more can be found at above BBC links. LOTS of videos/photos and more at above link too! About this Video: Libyan rebels celebrate after recapturing the strategic eastern town of Ajdabiya from Colonel Gaddafi's forces. It does my heart glad to see the peoples of Libya cheering all the new ground being taken from Colonel Gaddafi's forces yet let there be no mistake... It would NOT be happening, at all, if not for the might of all that Coalition airpower. 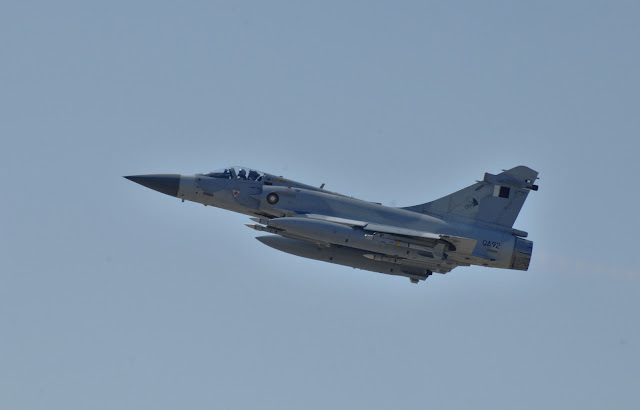 SOUDA BAY, Greece- Taken March 25, 2011: A Qatar Emiri Air Force Dassault Mirage 2000-5 fighter jet takes off as part of a Joint Task Force Odyssey Dawn mission. Joint Task Force Odyssey Dawn is the U.S. Africa Command task force established to provide operational and tactical command and control of U.S. military forces supporting the international response to the unrest in Libya and enforcement of United Nations Security Council Resolution (UNSCR) 1973. UNSCR 1973 authorizes all necessary measures to protect civilians in Libya under threat of attack by Qadhafi regime forces. WASHINGTON, March 26, 2011 - The military mission in Libya is succeeding and preventing further atrocities against the Libyan people by Moammar Gadhafi and his forces, President Barack Obama said today in his weekly radio address. Obama said that “because we acted quickly, a humanitarian catastrophe has been avoided and the lives of countless civilians -- innocent men, women and children -- have been saved." The commander in chief credited the part played by U.S. troops in “Operation Odyssey Dawn,” which was launched March 19 by coalition forces to enforce a U.N. Security Council resolution to protect the Libyan people from Gadhafi’s forces. "Thanks to our brave men and women in uniform, we’ve made important progress," Obama said, noting that he faces “no greater decision” than sending U.S. forces into harm’s way. He also said the U.S. “should not -- and cannot -- intervene every time there’s a crisis somewhere in the world." Gadhafi’s brutality against innocent Libyan people, however, made the military action necessary, he said. "When someone like Gadhafi threatens a bloodbath that could destabilize an entire region, and when the international community is prepared to come together to save many thousands of lives, then it’s in our national interest to act. It’s our responsibility,” he said. “This is one of those times." Over the past week, Obama said that U.S. and coalition forces took out Gadhafi’s air defenses and stopped his forces’ advancement across the country. Libyan forces also were pushed back in Benghazi, a city of about 700,000 people, where Gadhafi threatened to show “no mercy” to the country's opposition. The president said that "Moammar Gadhafi has lost the confidence of his people and the legitimacy to rule, and the aspirations of the Libyan people must be realized." Obama explained that the role of American forces has been limited... and the U.S. is acting in concert with a multinational coalition. “We are not putting any ground forces into Libya. Our military has provided unique capabilities at the beginning, but this is now a broad, international effort,” he said. 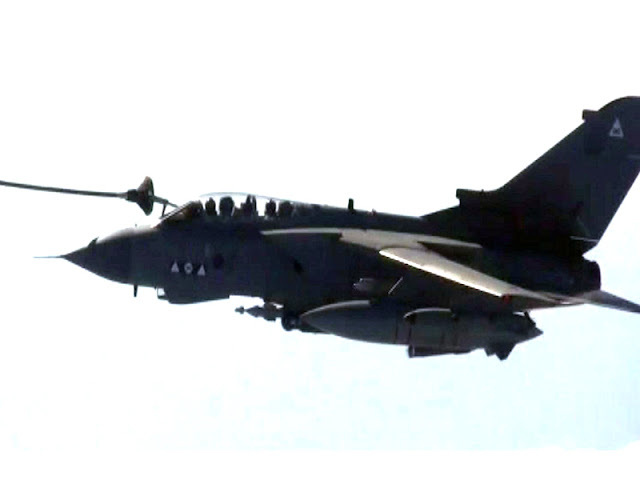 “Our allies and partners are enforcing the no-fly zone over Libya and the arms embargo at sea." The president noted that "key Arab partners," such as Qatar and the United Arab Emirates, have contributed aircraft to the effort. Obama said this is "how the international community should work, with more nations, not just the United States, bearing the responsibility and cost of upholding peace and security. "This military effort is part of our larger strategy to support the Libyan people and hold the Gadhafi regime accountable," he said. "Together with the international community, we’re delivering urgent humanitarian assistance. We’re offering support to the Libyan opposition." By freezing tens of billions of dollars of Gadhafi’s assets, the needs and aspirations of the Libyan people can be better met, he said, "and every day, the pressure on Gadhafi and his regime is increasing." 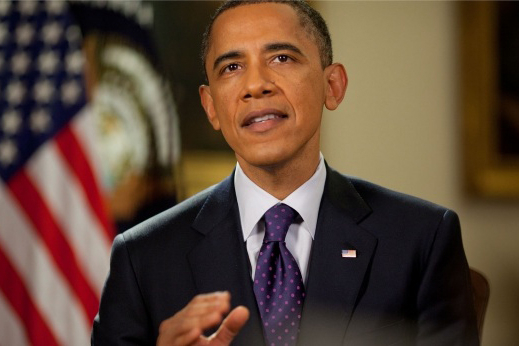 Obama said that Libyans have begun expressing their gratitude for the mission. "Every American can be proud of the lives we’ve saved in Libya and of the service of our men and women in uniform who once again have stood up for our interests and our ideals," he said. "And people in Libya and around the world are seeing that the United States of America stands with those who hope for a future where they can determine their own destiny." About this short News Video: Anti-Gaddafi forces enter the strategic oil town after an all-night battle.